Lets Quilt Something: Buy a Craftsy class, get one FREE! Whether you are a beginner quilter or a experience quilter here is something I think you all will love! Craftsy is a wonderful website if you haven't heard of it already. 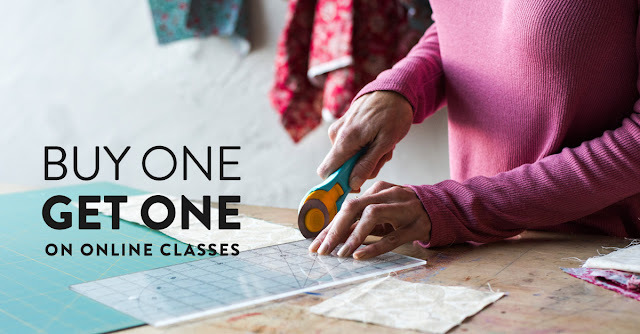 Craftsy is offering a Buy one class get one free deal which is amazing. Now Craftsy does more than just quilting/sewing related classes. If you have ever wanted to learn how to knit, crochet, bake, cooking, paint, etc. they have classes on that too! Some of my favorite food classes they offer are with breads. I am part french and we love our bake breads. Also do you love Angela Walters? Elizabeth Hartman? Lori Kennedy?, Amy Gibson? Leah Day? Just to name a few... they also have classes listed on Craftsy. Now in order to get this deal you'll need the secret discount code to add to your cart... lol just kidding it isn't a secret but the code is "BOGOJAN17". So if you have been looking at buying a Craftsy class now you can get a second class of equal or lesser value for free! *Some exclusions apply. Limit one per user. Cannot be combined with any other offers. Expires January 15, 2017.